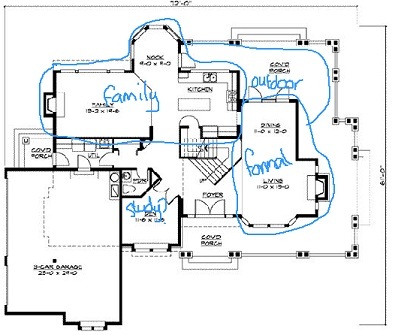 This is all about how to look at floor plans for a house and relate them to the outdoor environment and surroundings. Think about the site and its features (sloping ground, trees, water, wind direction and other features on the site) and surroundings (views, surrounding buildings, neighboring noise sources such as roads). If you’re building a new home this will help you think about where to locate your home on the land. Think about the views from inside the house to the outside. Think about the views from outside the house to the inside and check that the privacy level is adequate. Assess the circulation around the outside of the home. 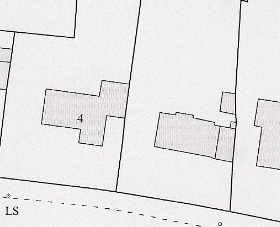 Consider the ratio and type (grass, trees, paving) of land to the front of the home to land at the back of the home and how these spaces are used. If there is no garage think about where you will park your cars. The height of the property you can build. The percentage of the land on the lot that the footprint of your home can occupy. Set backs from the street and boundary lines. Sometimes even the style of home you can build. Make sure the floor plans for a house are placed to take full advantage of the sun (in a temperate climate) or placed to be protected from the sun (in a very hot climate). The home will gain a lot of passive heat if it has windows on the ‘sunny’ side. 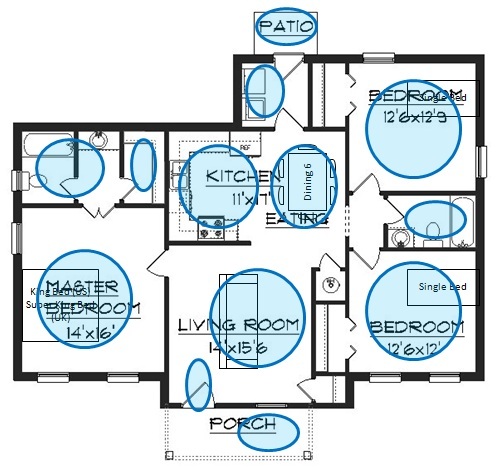 Decide if your main living rooms and outdoor living space should be in the sun or in the shade and see how the floor plan measures up with this. Work out what roughly what shadows will be cast by surrounding buildings and trees. Remember the sun rises in the east and sets in the west. If you’re located away from the equator the path of the sun changes throughout the year with the sun high in summer and low in winter. The difference of this variation gets bigger as you travel from the equator to the poles. If you’re in the northern hemisphere the sun is in the south, the opposite if you’re in the southern hemisphere. In the northern hemisphere northern light gives a diffused flat light that doesn’t change much if it’s a sunny or a cloudy day. Southern light is brighter and windows on the south side will receive direct sunlight if it’s sunny. Turn that on its head for the southern hemisphere. Wind – let’s think more in terms of gentle breeze. If the climate is hot, a gentle breeze can be a real bonus to say the least. On the flip side - if there’s a strong, persistent wind then the house should be orientated to provide shelter from the wind. It’s just another thing to bear in mind when thinking about how the house is orientated on the land. Sometimes you can figure out the prevailing wind direction just by looking at the surrounding trees. It’s also worth checking the wind rose for your nearest location. A wind rose plot shows the direction, frequency and speed of winds from any particular direction. In the wind rose plot below the wind comes mainly from the south. Look at the wind rose for each month for your location to get a picture of the winds during the year.